So Mark runs away. He leaves home with his camera, his notebook, his dog, and a plan to reach the top of Mount Rainier, even if it's the last thing he ever does. Mark is at breaking point. He's spent his life battling illness, missing milestones while being hospitalised. Now, he's had enough. With his dog Beau, Mark is running away. Already living on borrowed time, he believes that his final stand will be on his own terms and decides he wants to climb Mount Rainier, a place he's only ever seen adorning a postcard. He's left behind his inconsolable parents and best friend Jess, the girl who has seen him at his best and worse, battling illness and dreaming of living a normal, and Cancer free existence. With Beau contained to a duffel bag, he sets out for the streets of Seattle with nothing more than sheer determination to reach the mountain. It's not long before Mark is reported missing, his parents frantically wanting their boy home. The streets are no place for a boy and his dog, and finds himself being set upon by a pack of thugs. Now with no money and nursing his bruised and possibly broken bones, the police are following the latest lead in the case of the missing boy with Cancer, unaware to Mark and his efforts to derail the search. Best friend Jess has pieced together the clues, clutching the only note that Mark left in their secret hiding spot. She's torn between keeping Mark's secret, or telling his parents and bringing Mark home. Mark had known she would figure it out. He trusted her. It was in her hands. Should she bring him back, and save him? Or save him, and let him go? But as Mark reaches the mountain, he's ready to die. On his own terms. But with Beau by his side, it's not Mark's life he finds in danger, but that of his best friend and companion that refuses to leave his side. Suddenly Mark doesn't want to die, all alone and lost in the wilderness of the snowy mountain, is he too late to choose to live? The Honest Truth was a poignant story about a boy, his canine companion and choosing to die on his own terms. Mark is a sensitive boy that has fought Cancer with sheer determination, but has now reached breaking point and leaves without a word to his parents. Destined to climb a mountain he and his late grandfather had planned to visit. He's freeing himself from the confines of terminal illness, but Mark is about to discover that the world his parents had sheltered him from, is as brutal as it is beautiful. His only friend on the road is Beau, the spirited little dog that has seen Mark through his Cancer treatment, recovery and now navigating his way towards Mount Rainier. His pain and frustration were nothing short of devastating. My heart broke for Mark, but what really pushed me over that emotional edge was Beau. With one blue eye and one brown, the little dog was incredibly loyal and heroic. There's no doubt that without his companion, Mark would have perished long before reaching the mountain. Dying and living. It's all such a mess. That's the truth. It made me mad. A sad kind of angry. 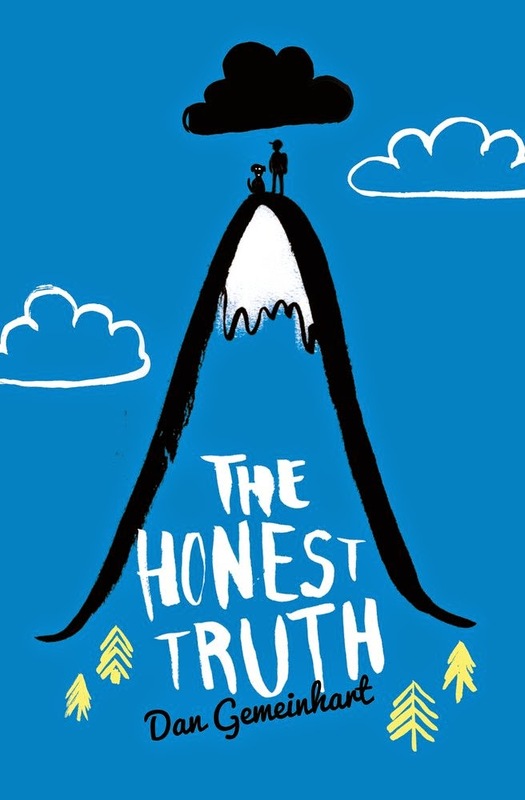 But even for a middle grade novel, The Honest Truth is incredibly compelling and honest. Mark's journey isn't easy, he's assaulted, tired, hungry, but resourceful. What struck me most, is that he seemed comfortable with the thought of dying on that mountain, even with his parents and best friend Jess never being too far from his thoughts. I was torn between wanting him to reach the mountain even if only to realise that his parents deserved more, and hoping that at least one person he'd met on his travels would have reported him to the police. When you're that age and need to fight each day to live, it would be hard to take others feelings into account. But Mark does reach the mountain, and the final few chapters left me breathless. I was far more invested than I'd realised and was almost on the verge of praying that both he and Beau made it home. It's simplistically written and due to the violence of mark being abused and his illness, I'd recommend it more for mature middle grade readers. But young adult fans will enjoy this one. A quick read that you can emotionally invest in. Thanks Jess. For a middle grade, it was really emotional, but it's lovely to see an author who isn't afraid to broach the tough subjects and bring a little maturity into the genre. It really is Mawa. And so emotional for a middle grade read. The author has done a fabulous job at creating a storyline that not only middle grade, but young adult and adults alike can invest in. I can't wait to see what you think of it. I got this in the mail from Scholastic and now I'M REALLY EXCITED TO READ IT. Might move it up the pile...it sounds really heart-breaking but the dog sounds adorable. The dog is gorgeous! Beau made me invest even more in Mark's story and the way he was so incredibly loyal absolutely endeared me to the little guy. THIS WAS SAD. I was just really sad reading it even though I do think the ending was sweet. Omg, I was so freaked for the dog though. Every time I read a book about a dog I PANIC. Authors are soooo mean about hurting/killing the adorable canines. I do much better with character deaths than pet deaths. <--- SHHHH. Do not tell anyone. I AM SO WEIRD. My heart can't handle seeing dogs die in any book, even fictional. I'm the same, it effects me so much more than seeing characters die too. We're both nuts. Also. PUPPY. I HOPE HE SURVIVES. Well I hope they both survive but you know what I mean. It is, but it's a great trigger for parents to talk to their preteens and early teens about it too. I know, puppies in poignant books and I don't usually mix too well, but this is so wonderfully written and well worth the read. I definitely agree with you about those last few chapters, Kelly! I was on the edge of my "seat" with worry, especially about Beau. And I was just hoping that everything would turn out okay, because before I knew it, I was caring about mark and Beau a lot more than I had originally thought! I think that this was such a lovely and surprising book, and I am so glad I picked it up. I'm really glad you did too, it was lovely wasn't it. I know the storyline was Mark's story, but my heart broke for how loyal and protective Beau was. Adding Beau was just a beautiful addition, it added to the overall emotion. Awww, Kelly... ;___; Would you believe that I cried while reading your review? This honestly sounds so beautiful and sad and inspiring at the same time. It reminds me a lot of Patrick Ness' book A Monster Calls when it comes to depth and heavy-ness, and up to this day, that remains one of my best books of all time. Just added to goodreads and am hoping to read it as soon as I can! I still haven't read A Monster Calls, despite having a copy on my shelf and Kindle. That reminds me, I need to read it soon. This one is simply beautiful. It doesn't romanticise cancer or Mark's journey either. I loved it. I can't wait to see what you think of it Faye. Thanks Becks. I was surprised how involved it was for a middle grade novel. The author did a fantastic job, I loved it immensely. Although, I'm starting to get tired of 'sick-lit', I can still be persuaded sometimes. It's interesting that this one is a middle grade. One would think the author has had to take measures to make it palatable to the target audience without losing subject matter's credibility. It does sound like he was successful. Me too Joy, especially when young adult authors such as John Green romanticise illness. Especially for a middle grade novel, Mark's reaction and his short life thus far was realistic and didn't try to gloss over his journey either. Incredibly gutsy, but it really worked. I've been good! Been busy doing the gardening lately, so haven't had as much time to read reviews or comment as much as I'd like sadly. Oh, this was good, wasn't it? I got super scared when I found out there was a dog because I cry so easily when animals are involved. It's the reason I can't watch animal movies anymore, gah. Anyways, I'm glad you liked it! The last bit definitely had me hooked. I do I Sam. When I realised he was traveling with Beau, I almost put it down. My heart can't take animals (especially dogs) being hurt, even fictionally. I'm sop glad I continued on though, it was just a beautiful read that I'm not likely to forget in a hurry. What is up with all the MG books all out to break our hearts? I've been eyeing this off on the TBR pile but haven't prepared myself emotionally enough for it yet. Dogs and terminally ill children are my downfall and I just...I just need a lot of time to prepare myself for it because I know I would be destroyed. I love how beautiful such a simple topic of choosing what to do with your life can entail, definitely looking forward to reading this now! I know! They aren't preteen reads any more are they. Most of the middle grade I've read in the last few months have all been emotional and incredibly poignant, this being among the best so far. Aw, the dog sounds adorable. I'm glad this was so well done; it is a tough topic, and for an MG novel, but these books are important. Kids this age get cancer or know people with it, and it's nice to get books for their age that realistically portray this. My thoughts exactly Lauren. The author did a wonderful job in showing the wide range of emotions that comes with having a terminal illness. I hope you can pick up a copy soon Lauren, it was wonderful. Fantastic, I'm glad this one has a bit of depth for a MG novel with a fantastic sounding journey. I love the sound of the dog in the novel too! Lovely review Kelly. It certainly has Jeann, a lot more than I'd originally though. And it packs a punch too, not only emotionally, but it doesn't shelter kids against the harsh realities of life as well. When Mark takes to the streets with Beau and is mugged for example, it doesn't hold back. It's still age appropriate, but for the more mature middle grader readers. Thanks Andrea, it certainly was. My thoughts were actually more so with Beau, the little dog. It made Mark's storyline all that more emotional. You're missing out though Lily. Middle grade isn't the fun adventures that we usually see, so many of late are incredibly poignant and the depth verges on young adult, if not for the characters ages. This one is one of the best I've read so far. Thanks Benish. It was wonderful, hopefully you can grab a copy soon. Looking forward to seeing what you think of it. The Honest Book sounds so heartbreaking and yet so sad at the same time. I'm a huge fan of MG, especially when it is written really well. I feel like Beau is just going to add to the sadness, too. For some reason, animals end up being a real tear jerker for me. I usually don't cry over books, but the only time I can remember crying over a book is when there was an animal in it, as I cried one tear over A Mango Shaped Space. I was pretty surprised at myself. Me too Ana. There's been some incredible middle grade books that have been released in the last six months, and this one if among the best of them. Beau is such a beautiful little dog, he refuses to leave Mark's side and really acts as his protector on the streets. I just read another review of this and it sounds like such an interesting, heartpulling story. I love how it effects readers and touches them- it actually reminds me of how I felt when I read Wonder. It seems like a really genuine story. I really enjoyed your review, Kelly, and am adding this to my tbr for sure! It really sounds creative and sad and wonderful! I’m already anxious to see what happens.